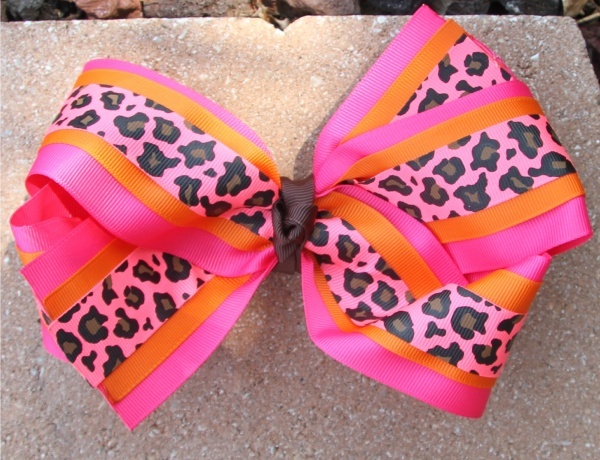 Shocking pink and bright orange colors highlighted with pink cheetah print makes this bow completely adorable! This is a triple layered bow that has a 2.25" shocking pink on the bottom, then a 1.5" bright orange in the middle, topped off with a 7/8" ribbon that has pink cheetah print all over. The middle is wrapped with a brown grosgrain ribbon and it is attached to a French clip. You have to get this bright fun loving cheetah bow!